MIL is among the few control valve manufacturers to have a strong engineering division and an efficient research and development wing. In the year 2000, MIL unveiled the Matrix series of extreme pressure, multistage, multi-path, axial flow control valves which has been designed to kill upto 420 bar pressure in 40 stages. 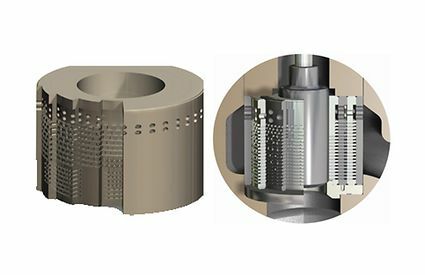 This ingenious and unique design has a progressively declining resistance flow path and is designed to eliminate cavitation and limit velocity in severe conditions. Unique Cage Stack: Consisting of concentric cages machined with hairline accuracy and welded together, it forms a rugged heart which can withstand the severest conditions. Fabricated out of tough martensitic stainless steel after heat treatment and case hardening, the assembly is a perfect example of MIL's engineering prowess. 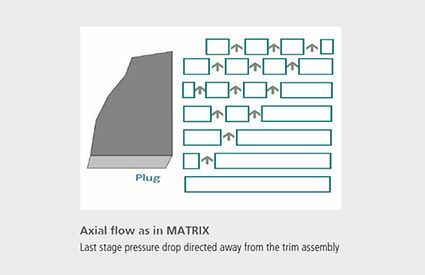 Advantageous flow direction: Matrix series valves, both axial flow and radial flow, are characterised by flow stream under the plug (flow tending to open) construction. 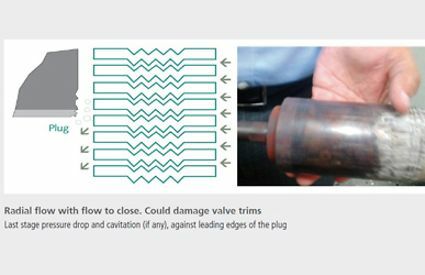 This unique feature conclusively eliminates dynamic instability, a major irritant that afflicts conventional flow to close valves and helps to eliminate the wire drawing and cavitation damage to the plug, which is prevalent with flow to close construction. The ingenious design avoids the last stage pressure drop (where chances of cavitation exists) against the plug thereby eliminating cavitation damage to the seating surface.